Finally I can say I own these. I have been collecting Joe's most of my life but these two have always seemed to elude me. Now that I have them in hand I totally understand why you just don't see them all that often. I can't believe that they would have survived more than one or two flights. The foam is paper thin so I can imagine how many were obliterated on their maiden voyage. I think I am gonna have to frame them. Although neither one of them are in mint condition I cannot imagine that too many of them are. My brother and I each got a Falcon but if I remember correctly pieces started coming off after a handful of flights. 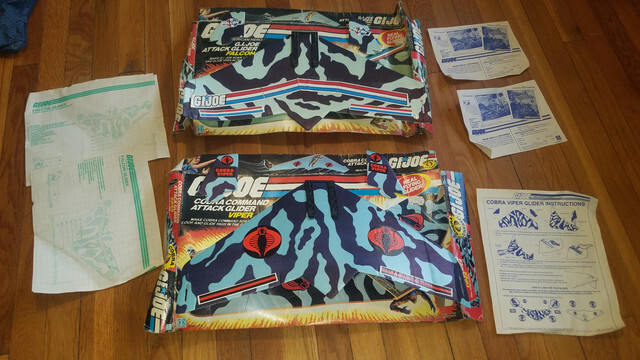 It's kind of amazing that any loose gliders have survived this long.